PHILADELPHIA (WPVI) -- The CDC released new numbers on the flu on Friday. The virus continues to blanket most of the United States, but there are signs that it's starting to slow down. It's still high activity in our area and most states. However, there is a change in the number of doctors visits. The number of people going in for fever, cough and body aches has dropped this week by about one percent. But, we are still seeing the virus hit hard and the number of kids who've died is now at 97. It's good news for Keyona Richardson. We told you about the 10-year-old in Colorado two weeks ago when she was fighting for her life on a breathing machine due to complications from the flu. She's now out of the hospital and recovered. The flu virus continues to wreak havoc, but for the first time in weeks, numbers are slowly starting to come down. H3N2 remains the predominant strain. It's known to cause severe illness and the vaccine this year isn't a great match to prevent getting sick but it can help prevent serious complications. Meanwhile some scientists are scrambling trying to speed up research to find a universal vaccine. GMA went into the National Institutes of Health where they're infecting healthy volunteers with the flu. Each participant is paid $3,500 dollars. "You're hoping to solve it down the road that you don't get the flu. Exactly. For myself and then for young children," said volunteer, Emily Yaltoo. Each year, the flu virus changes a little, but a few parts stay the same. If researchers can develop a vaccine attacking those parts, then we wouldn't need a shot every year and it should protect against different strains and mutations. 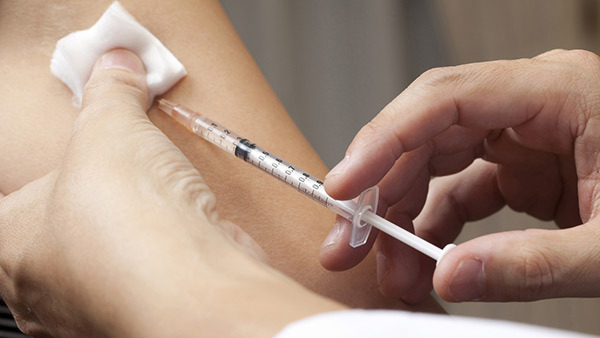 And there's some good news for parents, or anyone who hates needles. The flu mist nasal spray vaccine may be back next year. A panel of experts has voted for the FDA to re-approve it as a vaccine option next season.